I’d read the previous two in the series a long time ago but gave myself a quick recap before reading this one. I loved the relationship between Mila and Hunter in the previous novels and was also quite excited to see if the dynamic between Mila and Sarah’s father Daniel was going to be explored in detail. First of all, there was lots to be enjoyed in this book. Fast paced action, time spent up in the snowy mountains, the mystery of a dangerous boarding school. All pretty exciting and fast paced. This book arrived at my house yesterday and by 1am this morning I’d finished reading it! The characterisation of an android protagonist fascinates me, especially as I have written a character which similarly blurs the line between human and machine. I felt as if we had been rushing down one road and then all of a sudden, we went down another. For me, the greatest frustrations of this book came from the romance and the ending. I was a Hunter fan. Crucially, I believed that if there was going to be any kind of romantic entanglement it would be with him. This caused me a little difficulty with the final book in the trilogy. Mila is much closer to Lucas in this book than I remembered him being previously. While I’ve seen some reviewers referring to the relationship with Hunter as insta-love, I found her feelings for Lucas a bit more confusing. I was constantly expecting there to be a catch with the way he felt. I wonder if part of my problem with the relationship aspect of the book was to do with my age — this read like ‘young’ YA and I’m not even a teenager anymore. I’ll not go into the exact details of the ending in case anyone is going to read it in the near future, but it was an odd one. Definitely not predictable. In fact, it made me wonder if the series had originally been intended to have another book even though all of the promotional material has always referred to it as a trilogy. Having a main character’s story end in such a way (and very abruptly too!) was difficult to process. The ending focused on redemption and to the last page the relationship with Lucas featured. If it had been done slightly differently, as with books such as Arise by Tara Hudson, it might have made more sense. The exact details of what happened to Mila meant that the ending could have been avoided, even as it was taking place. That option was even presented by one of the other characters. Sacrifices are noble but sacrifices that don’t have to be made just feel sad. This was a book which felt like it had a lot of potential, yet just fell short. 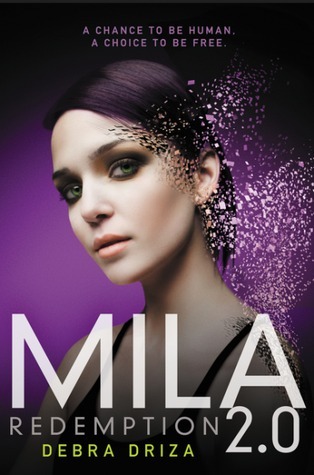 Mila’s characterisation was still wonderful so I’d definitely read if you’re wanting to see an android MC or enjoyed the earlier books. If you haven’t already invested in the series, it’s harder to recommend. The ending to the trilogy is definitely one you will either love or hate. There’s not really a middle ground. If you’ve read it, I’d love to know what you think!